I am so honored to be part of the monthly link up party Our Growing Edge, which was created by Genie De Wit at Bunny Eats Design to connect bloggers and inspire us to try new things. This month the event is hosted by food blogger Francesca at Fearless Kitchen. Hope you enjoy! I have a friend named Josephine who is eight feet tall and weighs 100 pounds. She is beautiful. The first thing you notice about her is her hair. It is long and lush and reminds me of a warm, safe place where as a child I’d hide. It’s also super curly but never has any frizz. It’s the hair I’ve always wanted but can’t have no matter how many products, specialized cuts or styling techniques I try. The second thing you notice about her is how nice and sweet she is, and how totally unfazed she is by motherhood. I wish I could be half as carefree with my children as she seems. Josephine is also 100% Italian. She speaks fluent Italian and vacations in Italy every year. To compare, I am part Italian, can say “parmigiano reggiano” with a killer Italian accent, and really enjoyed our recent getaway to Myrtle Beach. Josephine’s husband, Loreto, is also 100% Italian and serves on our town’s Little League board along with my husband, who does not have any Italian blood whatsoever. Loreto recently invited all of the board members to his home for a meeting and “traditional Sunday gravy” made by his wife. My husband was pretty psyched when he got the email, but that was nothing once he started eating. He began texting me. Now, I’d like to point out that over the course of our 13 year marriage, I can count the number of times I have served my husband jarred tomato sauce on one hand. Because I am part Italian, I know how important it is to make homemade sauce, and years ago I was lucky enough to secure the recipe of Grandma Marionni, my friend’s Italian grandmother-in-law, and have made it so many times I now have it memorized. I have used it over and over again in countless lasagnas, baked zitis, and chicken parms. My husband is not deprived of authentic Italian cooking at all, so I guess I was a little surprised he was so impressed by Josephine’s gravy. But, whatever, I was just glad I didn’t have to cook for him that night, and also — how nice was it of her to cook for the entire Little League board? And right after the holidays??? Oh brother. 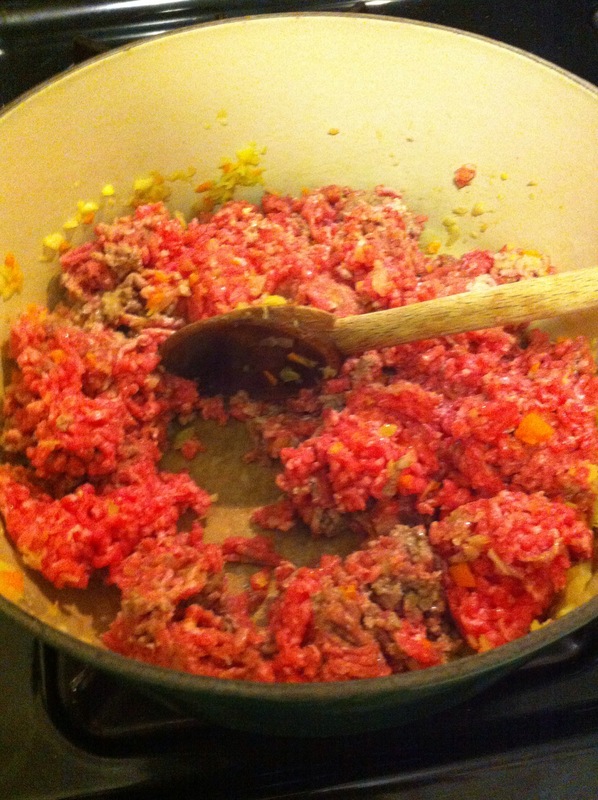 Years ago, in a move to make us healthier, I started making meatballs from ground turkey. They are awesome, but my husband doesn’t agree. In his world, meatballs should be made of meat. From this one word text, it was clear to me that Josephine’s meatballs weren’t made of turkey. Good grief. Ok, that does it. 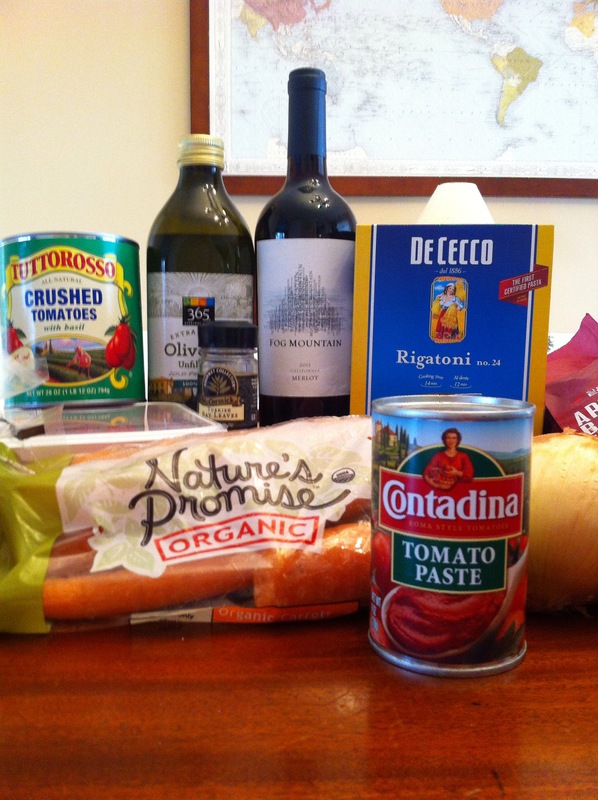 Right then and there, I resolved to make my non-Italian husband a real Sunday gravy with real meatballs. I consulted my Sopranos Family Cookbook and learned that I would have to obtain a meaty pork neck bone and run a can of peeled tomatoes through a food mill. Forget it. 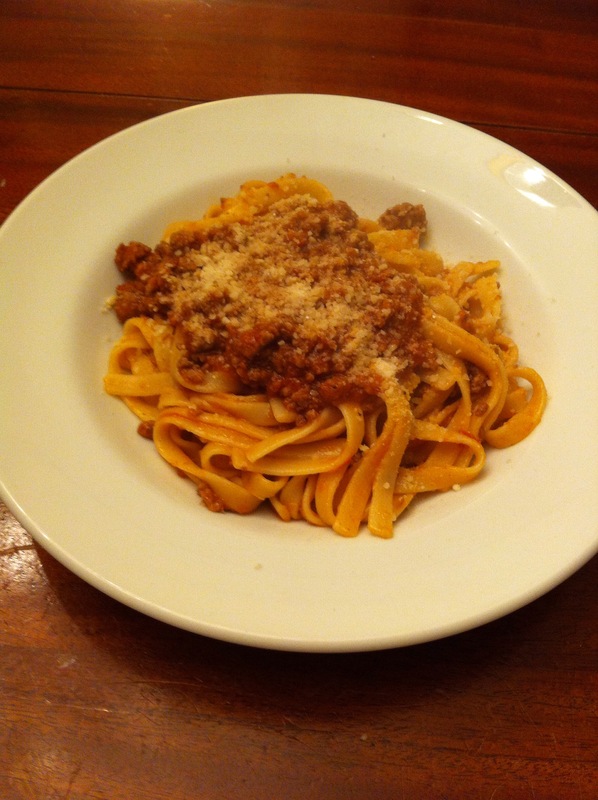 My second idea was to make an authentic bolognese. I have never made one before. 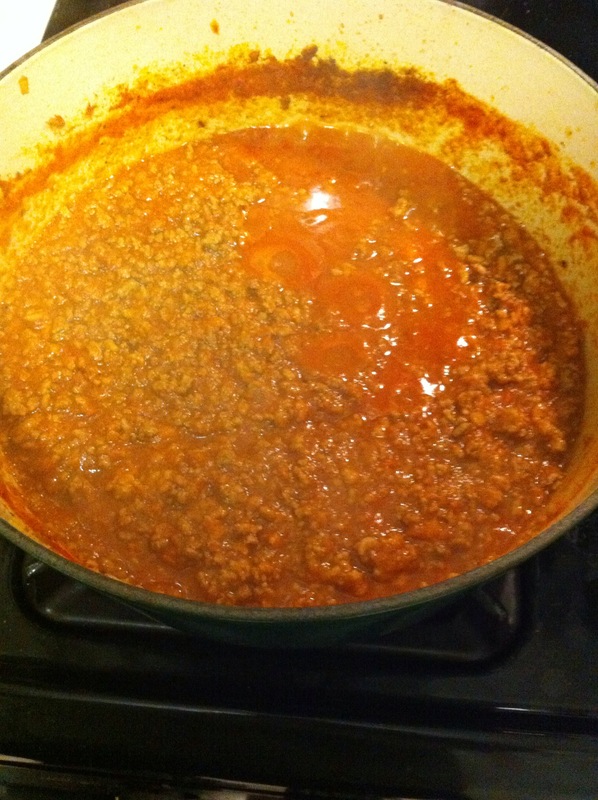 I mean, sometimes I will quickly cook a pound of ground turkey and add it to Grandma Marionni’s sauce right before the pasta is done and pretend it’s bolognese, but I know it’s not. 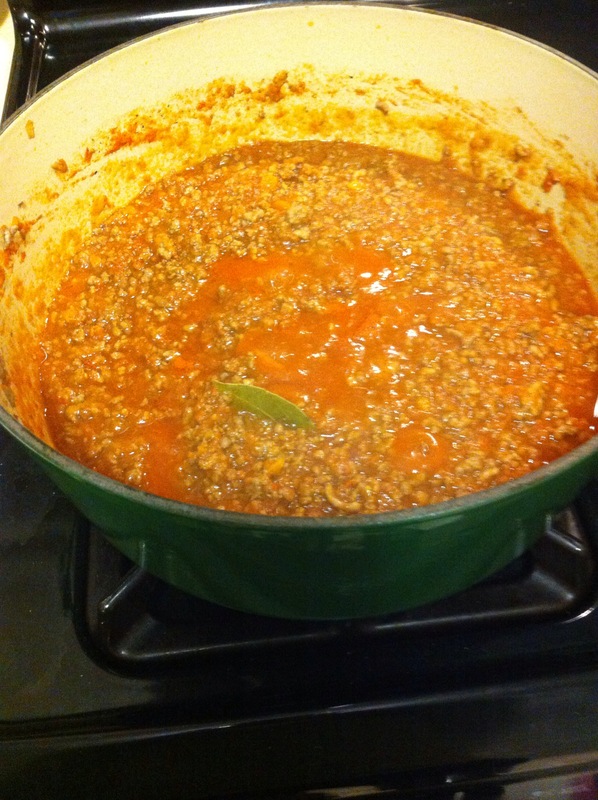 A true bolognese is something I’ve always wanted to make, but never had a reason. 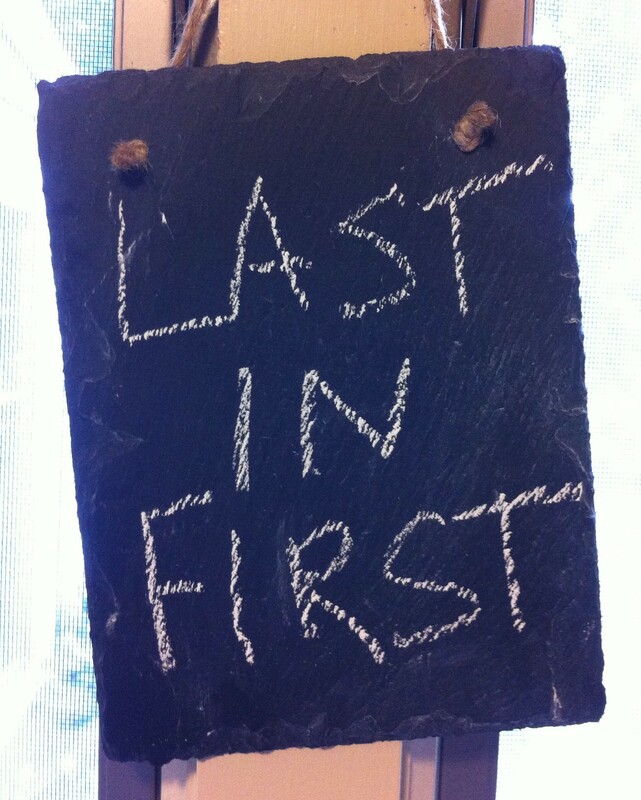 Until now. I contacted Grandma Marionni’s granddaughter-in-law for advice and she told me that Lidia Bastianich’s recipe was the best and that I was to not, under any circumstances, make the one from Giada. 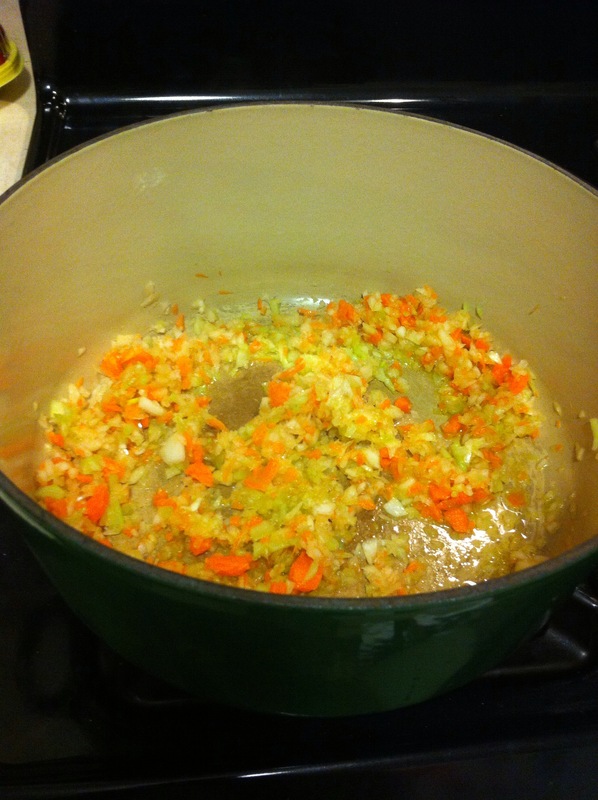 Step One: Saute the vegetables in olive oil. 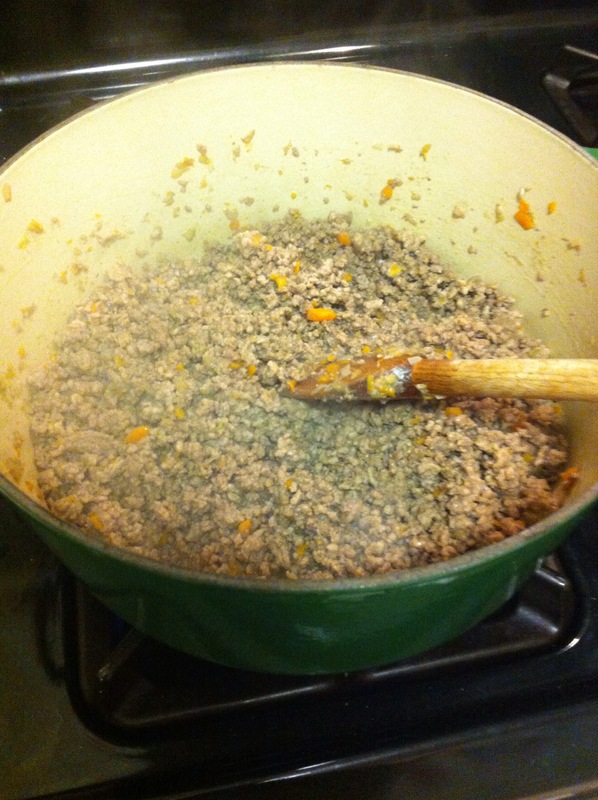 Step Two: Add beef and pork. Step Four: Add tomatoes and bay leaves. Step Five: Cook for three hours, adding water every now and then so that the meat is always covered. Step Seven: Receive just as many compliments from my husband as Josephine, including my favorite, “This is restaurant quality.” I personally felt it needed more salt (Lidia doesn’t give exact amounts of salt; she says to salt things “lightly,” but her idea of “lightly” and my idea of “lightly” are, I think, two different things). Nevertheless, my husband didn’t seem to mind. I think he just loves to eat. And I wouldn’t have it any other way.